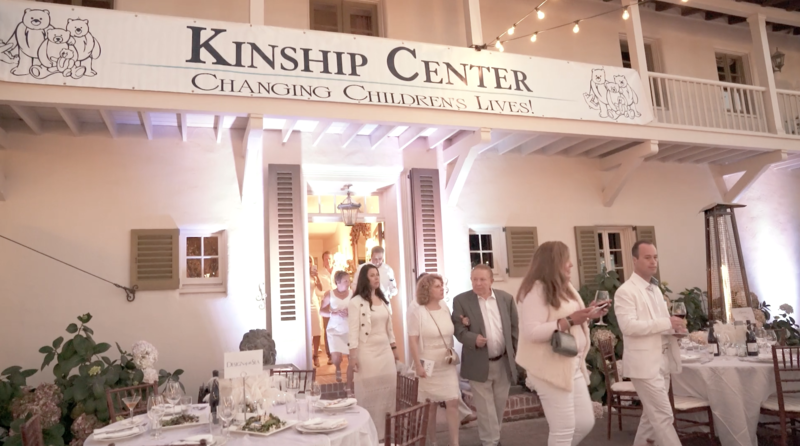 The Kinship Center’s 4th Annual White Party Gala 2016 fundraiser is a once-a-year opportunity to raise necessary funds to support the Center’s ongoing programs. This year’s event took place in Pebble Beach with generous supporters raising money to, “change lives, one child at a time. The evening of exceptional food was prepared by chefs from local restaurants: Chef Cy Yontz, Rio Grill, Chef Todd Fisher, Tarpy’s Roadhouse; and Chef Tony Baker, Montrio Bistro and paired with local award-winning wines. Live and silent auctions helped raise program funds. Highlights of the evening included a video produced by us of the three chefs in the clinic garden planting vegetables and sharing their knowledge about food nutrition and healthy lifestyle choices, as well as a first-person account by Devin Eastman, Monterey County’s 2016 Outstanding Philanthropic Youth, on the Horse Camp for kids she put on as part of the Family Ties program. The Center’s focus, that all children deserve a safe, loving and permanent family to stand by them and grow with them, was celebrated as guests ended the evening dancing under the glow of the starry skies.